Holds up to 72 Three inch ornaments. 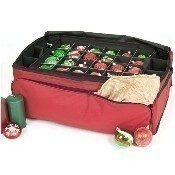 Includes 6 side pockets for taller ornaments and decor. 2 Removable trays make decorating easier. U-shaped top zipper for easy loading. Front pocket provides additional storage. Heavy duty polyester fabric with PVC backing. Durable self-correcting zippers. Dimensions 26" x 15" x 10".